Experts say the West Virginia teachers may foreshadow the future of organized labor, especially in the public sector, at a time when its power has been eroded in much of the country by anti-union legislation and by court challenges like the Janus case, now before the Supreme Court, which threatens the financial viability of collective bargaining. Public employees in other states have taken notice. Teachers in Oklahoma have been talking about mounting a West Virginia-style statewide walkout in early April if the Legislature does not raise their pay by then. In Kentucky, a pending bill to reduce pensions for retired teachers has prompted protests and talk of strikes. That model, driven by grass-roots anger, can flummox politicians. Mitch Carmichael, the Republican president of the West Virginia Senate, opposes collective bargaining for public employees, but he acknowledged that the decentralized aspects of the strike made it difficult to reach a settlement that would satisfy the teachers. National union leaders said the situation in West Virginia revealed the pitfalls of government policies intended to hobble them. “If the right wing gets what it wants and tries to eliminate collective bargaining in the public sector, then politics — this kind of political activism at the ballot box, in the State House — will be the only avenue,” said Randi Weingarten, the president of the American Federation of Teachers, a national teachers’ union. The West Virginia teachers found ways to organize and act outside the usual parameters of traditional unionism. Teachers and service workers across the state aired their frustrations in an enormous Facebook group, and their walkout ultimately included members of three different unions and many people who did not belong to any union. When they defied union leaders’ calls to end the strike on March 1, the strikers redoubled the pressure on lawmakers to deliver on their pay raise. The lesson, experts said, is that undermining public sector unions, as the Janus case seeks to do, will not guarantee labor peace. 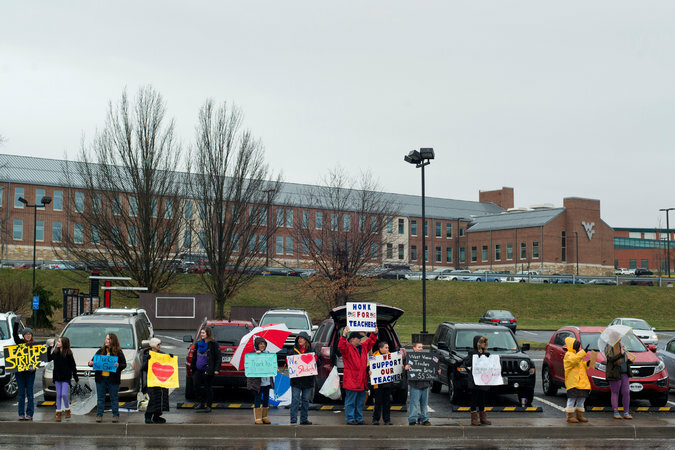 With no collective bargaining rights, no contract, and no legal right to strike, teachers in West Virginia managed to mount a statewide work stoppage anyway. Indeed, some teachers who went to the meeting at the mall in Morgantown said their lack of collective bargaining rights left them no choice but to continue their strike. Wildcat strikes led by rank-and-file workers are rare these days, but they recall the big miners’ strikes that racked West Virginia’s coal country in the early part of the 20th century. That pattern of labor activism changed with the passage of the National Labor Relations Act of 1935, sometimes called the Wagner Act, giving most workers a federally protected right to form unions and engage in collective bargaining. The Wagner Act does not cover public employees, though, and some states, like West Virginia, do not give public employees the right to bargain collectively. For that reason, the state’s two teachers’ unions, the West Virginia Education Association and the state branch of the American Federation of Teachers, do not function as those in other states might, although they do lobby for teachers and help with grievances. Membership is voluntary and far from universal. Even so, they were quick to respond as frustration built over rising health insurance costs and other issues earlier this year. It was the unions that started the long walkout by conducting a vote and calling for the statewide work stoppage, which began on Feb. 22. At that point, the course of the strike was in the hands of teachers in each of the state’s 55 counties making their own separate decisions about what to do, though they monitored the mood elsewhere over social media. In Mr. Price’s county, teachers gathered for a heated meeting at a high school, where people stood up and cried out every time they heard that another county’s schools would be closed the next day. And in Morgantown, it was Anna Simmons, 26, who called the meeting at the mall, intending to talk over the idea of defying the union leadership and staying out with some of her colleagues at the elementary school where she works as a counselor. She was stunned when so many teachers from other schools showed up. West Virginia’s strike is over now, but the problems and the activism that drove it are not. In Oklahoma on Wednesday, the state’s largest teachers’ union announced it was accelerating its timeline for a statewide walkout, catching up with the fast-moving plans of activist teachers who had already been organizing a work stoppage in protest of low pay — on average, the lowest in the nation.